Just landed in Germany after seven weeks of trekking in the Annapurnas and the Everest regions. Late spring snow brought some new challenges this season but I like to think those of us facing the odd blizzard, handled it well and found out something about ourselves in the process. My first group was all women (again). Joyce and Anne are from Melbourne, Blanche is from Perth (our first Perth customer), Rikki is from Apollo Bay (our third customer from this little village by the sea) and lastly Robin, who lives just outside Geelong and has previously trekked with me to the Everest region. I travelled up to KTM with this group and we arrived to a clear sunny day with a light sprinkling of snow on the nearby hills and a lama dancing puja under the big canopy at the BPD Monastery. Like me, Robin felt instantly ‘at home’. Our bus trip to Pokhara went really smoothly; with no Maoist activities on the road these days it only takes 6.5 hours. All the porters were at the bus depot to meet us and everyone was soon comfortably at home at the Lake Diamond. Shopping was mainly for trekking gear – rucksacks, daypacks, fleeces and jackets, a few walking sticks, etc. Joyce probably broke the shopping records with her haul of lovely shawls from Dinesh’s all too wonderful collection. Our first day was cool, ideal walking weather and all trekked well. Blanche was slow but steady and I knew, even at this early stage, that we would all be fine. The second day is a tough climb and everyone was happy to sit around the big stove at Banthanti – a little whisky didn’t hurt either. Our climb up to Gorepani was different. We hit the snowline half an hour after we set off. After lunch it got decidedly wet and slushy but the rhododendrons cloaked in snow were stunning. Gorepani loomed out of the mist around 4 pm, much to the relief of the back-markers. As usual we hit the dance-floor pretty hard that night. A couple of extra hands were hired next morning to help us get down the steep stairs below Gorepani – much harder than usual with a foot of snow on them. Sikha, as usual, had no electricity but the boys improvised some music with a tabla drum, clapping and singing and we soon had a few new moves shown us by Joyce who had been practising with the locals during the afternoon when we came across a ‘first rice eating’ party in a small village. People here celebrate when a baby takes its first solid food. By now the group was beginning to find their own trekking rhythm so our little group would string out along the trail between food and drink stops. At Ghar Khola I was surprised to find the big bridge closed due to road-works on the far bank. Instead, we trekked along the East bank of the Kali Gandaki for half an hour to a little temporary bamboo bridge into Tatopani. Folks disappeared to the hot springs pretty quickly and consequently looked pretty flash for dinner that night. A hair-wash and a clean t-shirt rendered most of us unrecognizable. Next day, our rest day, was a dream of cinnamon rolls with coffee in bed, a stroll to the shops for chockie bars, phone connections to the outside world and then another trip to the hot springs. A shared nightcap was a fitting end as we made some new international friends. The trip up to Ghasa is always long and hard in one day from Tatopani but, with an early start and a pre-ordered lunch we made it easily – all in before 4.15. 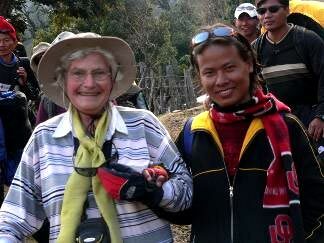 Blanche has really got the hang of it now and hiked from Kopchepani to the Pairo Taopolo tea shop in under an hour. A lot of fitter, tougher types would be proud of that statistic! A great lodge, The Eagle Nest lived up to its reputation as we chatted through the evening with new friends Lars, Carlos, Gao and Marine. The trek up to Kalopani seemed easy after yesterday’s big effort. Sweetie’s baby had to be seen to be believed. Huge head, kohl-rimmed eyes and wearing a truly hideous bonnet. What could we say except ‘oh, how adorable!’. Joyce was knocked over by a donkey on the way but survived unhurt. I walked back the ten minutes to the KGH for a phone call but no joy. It had snowed throughout the evening and the silence was exquisite. Crunchy underfoot, completely dark with a slight pht, pht, pht of gentle snowfall. Scored a bottle of Bagpiper – finest Indian malt, so it wasn’t a complete waste of time. Combined with a ‘hot table’ it went down well. Those Neerim South gals who introduced me to the wickedness of whisky and coke last season have a lot to answer for!! The morning at Kalopani was one of the most beautiful I’ve ever seen on trek. Completely blanketed in snow the landscape shone in bright morning sunshine. Travelling on the newly made road on the West bank of the river the views back to the Annapurnas and up behind us to Daulaghiri were truly ‘awesome’. 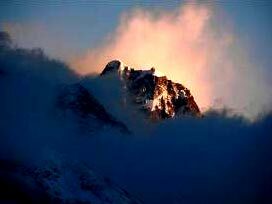 You will redefine your use of the word ‘awesome’ once you see some of this Himalayan scenery. The village of Tukche never fails to impress with its white-washed houses, carved wooden windows and ‘juliet’ balconies hanging over the narrow street. We managed a brief but stunning view of the peaks in the moonlight before turning in. The walk into Jomsom was uneventful, no sign of the crappy weather waiting for us that night. We awoke to fairly steady snow and held a brief post-breakfast pow-wow to rethink our itinerary in light of the new conditions. Thinking that the possibility of flights would get slimmer with every hour of snow we decided to trek back down and out through Beni. 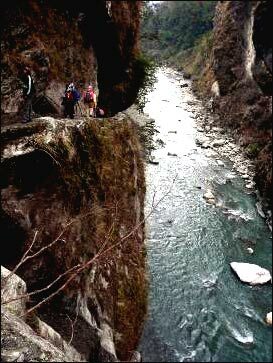 As it turned out this was quite possibly the worst day of trekking ever! That’s what it says in my diary. Once the snow stopped it was replaced with a cold driving rain, pushed into our faces by a howling gale coming straight at us. In an hour and a half we made it to Marpha and it took about two hour to recover; one to thaw out and one to eat some hot soup and hot chocolate. We decided to tough it out to Tukche as it would give us a shot at Ghasa the next day. Arriving in Tukche cold and wet our hosts were great and soon had charcoal braziers fired up under the washing lines of jackets and pants spread out all over the dining room. It worked; we set out next day in dry gear and none the worse for our experience. Apart from the mental scars that is! And no complaints – that’s what I call a team! 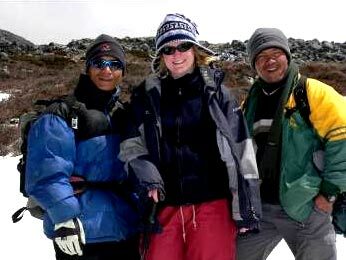 I enjoyed the trek down to Ghasa but some of the crew was tiring due to the harsh conditions the day before. Motor bikes were soon called into service and Rikki, Joyce and Blanche were whisked away to the relative comforts of the Eagle Nest. I did hear reports of having to get off to walk across the muddier sections but, having walked the whole way, I was probably not that sympathetic. Our decent to Tatopani was magic. Clear, sunny and warm – just what the doctor ordered. From thermal underwear to sun-cream in less than 24 hours. Cleaned up in Tatopani. 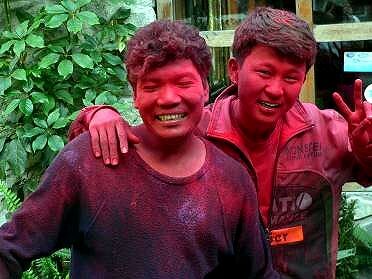 Especially the boys who had indulged in the Holi festival. The walk out from Tatopani is very pretty and almost flat. 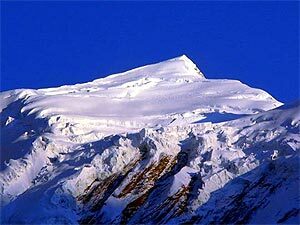 A couple of difficult ridges (see opening shot of Blanche) and we arrived in Tiplyang by eleven. After a quick cuppa I commandeered a jeep – very scary but so efficient. Weaving through donkeys and then hanging over the edge of the river bank. Joined forces with a small band of Israelis to take the local bus all the way to Pokhara. A long drive but it got us back onto our original schedule despite the blizzard. Within hours of arriving back in Pokhara we were clean and heading for the shops in fresh clothes. Serious shopping too, lots of shawls, scarves, jewellery and the odd souvenir. After a leisurely recovery day in Pokhara we enjoyed the bus trip back to Kathmandu – no work to do, just sit back and watch the countryside whiz by. Staying in Thamel at the Norbu Linka was very handy for shopping and there was plenty of it done. Anne bought great jewellery for her daughters and everyone liked the fixed price wholesale store. Many delicious meals were consumed at the ‘Weasel’, like that Nepali classic ‘spinach and mushroom cannelloni’. The only serious problem on departure was just how much luggage these people had. I taxied back to Thamel and collapsed in my bed with my usual comforts – a huge bar of Swiss chocolate and a clear phone connection to the outside world – courtesy of Mero Mobile. 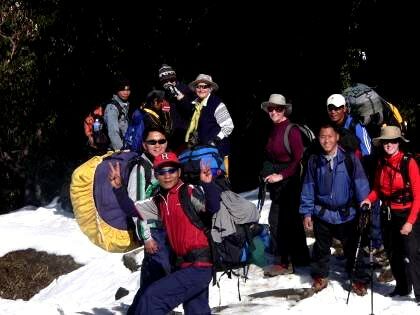 The Everest group seemed to arrive moments after the Annapurnas group left. The flight was delayed but since all the clients had overnighted in Bangkok they were in good shape. We had Barbara from Perth, Kristen and Craig from Melbourne and Heather from Tamworth who trekked with me 3 years ago in the Annapurnas. Our first day in Kathmandu was rainy so we rescheduled the trek briefing for the morning. This group is the best I’ve had at grasping ‘A Few Words of Nepali’. After an afternoon of shopping for gear (some very nice jackets were in evidence) we dined in while waiting for enough electricity to do our packing. The flight to Lukla got away at 8 am and after half an hour of spectacular mountain scenery, Lukla airstrip loomed below us – an incredibly small target. Cold at first, a big brekky at the Sunny Garden was very welcome after our early start. There were serious doubts about Kancha’s flight arriving so we set off with a stand-in. We needn’t have worried, he soon caught us up and, with Dorje as Guide, Lahar as Number 2, Bir and Dhan made up the team. Barbara shot out of the starting gate like a rocket, and some of us didn’t catch her till we arrived at Phakding. This was a fairly easy first day so we trekked over to the old gompa across the river after a hearty lunch. This is really scenic countryside, little farms, buffaloes, new calves, fruit trees in blossom and tantalising glimpses of Kussum Kangaru. Our first night on trek is always a challenge – narrow beds, thin mattresses, and the eerie silence of NO TRAFFIC AT ALL! Next day started fine and clear. Easy trekking here along a beautiful river bank. Dorje’s choice of lodge at Jorsale turned out to be a shocker. After spotting a huge rat in the bathroom upon arrival we decided to decamp to the very posh Nirvana Lodge just one hundred metres up the road. Great move. Big beds, clean linen, spotless house, great bathroom, fine food, lovely Bhutanese didi – we will definitely stay here again. So, the big day arrives, the climb up to Namche Bazaar. Heather and I paced ourselves but still arrived in good shape just after lunch. The nice rooms at the Everest Hotel with attached bathrooms were put to good use as were the phone and internet services of this huge village. Only Barbara fancied the day-walk out to Thamo so, after a quick schlep up to the viewpoint to see the big peaks (Everest, Ama Dablam, Lhotse, Thamserku) we set out in warm, clear sunshine. As usual, this was a lovely day out with a delicious daal-bhat at the Maya Lodge and a visit to the Ani gompa. Found another beaut old Tibetan cooking pot – just what I need? Onwards to Kangzuma. An easy day so no need to start early. New trek pants for Barbara and a new jacket for Bir. We are looking good. The view from this lodge is unmatched. Thamserku just glows into your bedroom window at sunset and the hospitality at the Ama Dablam lodge is legendary. Exquisite sunset. Next day saw us heading down to Phunki Tenga early. A bit of extra breakfast to help us climb up to Thangboche. The new trail is no easier than the old one (steeper in places). 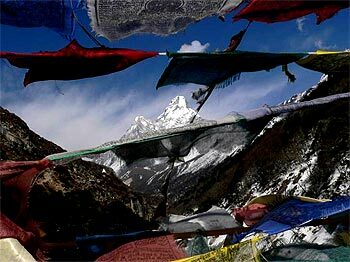 The bakery was closed and, as it was only lunchtime, we decided to push on to Pangboche. This took longer than expected due to the snowy trail between Thangboche and Devouche. I found it rather fun in the snow and ice but soon realised this joy was not universally shared. Taking so long to make Pangboche really tired us out and everyone opted for a very early night. 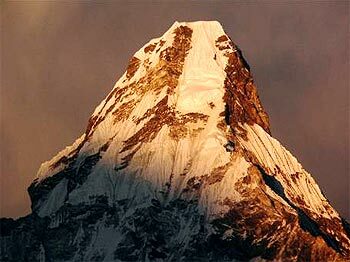 Met Brad from Karratha who had recently climbed Ama Dablam (yep, the one in the picture above). Our ascent to Dingboche next day was much easier because we had knocked off the hardest climb on the previous afternoon. 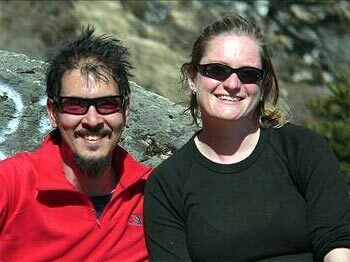 Heather opted to return to the Ama Dablam lodge – I may have mentioned that their hospitality is legendary. 4000 metres is quite enough for some people. After a long sunny break at Somare and Tsuro we are in Dingboche by midday. Barbara found our lollygagging a bit restrictive and opted to get going with Bir at her own, faster pace. The morning broke clear and sunny, ideal at this altitude for a longish walk up to Chukung. Barbara is trekking downhill today and will catch up with Heather, then us, at Kumjung. 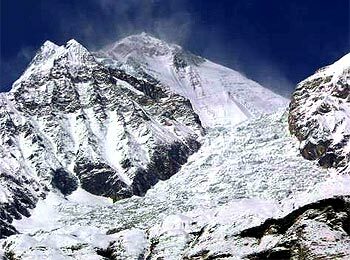 So, reduced to a posse of six, we headed up the long, slight incline to Chukung at 4760. A tea-break baking in the high-altitude sun almost put us to sleep but we powered on and were soon ordering an outdoor lunch of soup and potatoes in the shelter of a lodge. It clouded over during lunch and we thought it best to make our move sooner rather than later – just as well. I reckon 10 – 15 centimeters of snow fell on the way back. 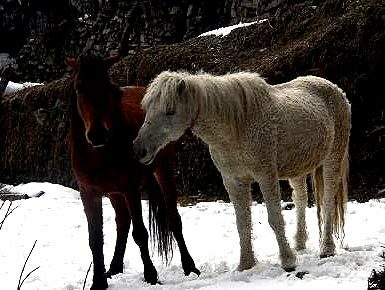 By the time I staggered into the lodge last, having followed my nose down the wrong trail for half an hour, I was covered in snow. 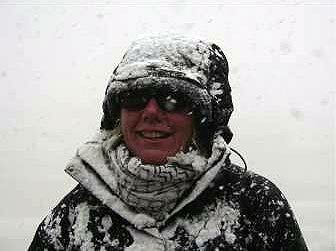 Being well kitted-out for this type of weather, we all thoroughly enjoyed it – certainly makes a change from Australia! Next morning broke fine and clear with a glistening blanket of snow over the entire valley. The sun soon melted a dry track up to the stupa where the views were stunning. The snowy weather the previous day had taken every particle of dust from the air so it really was crystal-clear. After a brief pause to enjoy we headed down. The villages flew by, cup of tea at Tsuro, lunch at Pangboche, more tea at Devouche then down, down, down to Phunki Tenga. Always cosy here, we met a Korean couple who had lost their porters. Luckily, they didn’t lose them for long (a navigational error perhaps). Big spud dinner, cards around the fireplace and a large (they had no small) bottle of whisky. Heaven. We’ve earned this. Climbed fairly easily back up to Kangzuma (we are fit now). After a long leisurely lunch we took the little short-cut up to Kumjung. It was very, very muddy! Kumjung was almost lost in the mist but we went for a quick look at the Yeti skull in the monastery before we left. Namche always looms very suddenly over the hill when you take this direct path. A knee-crunching descent down the little trail had us back in our original rooms at the Everest Hotel in time for a late lunch. Descending to Phakding next day was a breeze – nice strong legs now and loads of oxygen in the air. Heather joined the boys for daal-bhat at the Nirvana, Barbara and I lunched at the Kailash in Monjo and we didn’t see Kristen and Craig for dust till we got into the lodge around 5 pm. They had been there for hours. These are very nice, kind lodge operators who make us feel very welcome, even in the kitchen – well, it’s warmer in there. The lodge owner’s big, shiny, new boom-box was all we needed to start dancing – Heather and Barbara seemed to get the hang of the local folk dancing pretty easily. It’s a fairly easy walk back to Lukla, if you don’t forget about the climb up for the last half-hour. Heather and I were the slow-coaches, stopping for a rather substantial lunch on the way. Very snug, eating in the kitchen. Back in Lukla we visited Bir’s family and then set about having a little fun. There’s a well-stocked bar at the Sunny Garden lodge and we soon hit it hard and cranked up the music soon afterwards. Where did Rajesh find Credence Clearwater Revival??? It was very hard to say goodbye to our lovely porters next morning. No drama with the return flight and we all grabbed a seat on the right side of the little plane. 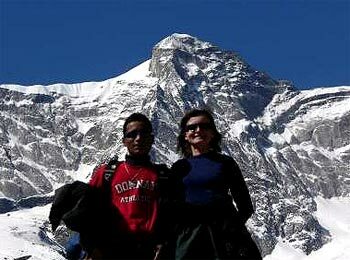 Kathmandu was warm and sunny which made shopping and sightseeing to Bodanath very pleasant. As I wasn’t returning to Australia it was hard to say goodbye. I’m writing this in the spring sunshine of far north-east Germany – seems like another world. I’ve got a great big St Bernard dog sitting on my feet and a walk in the green woods planned for later in the day. Still, I’m on the internet most days, and planning to return to Australia before next season looms too close. So, if you’ve just read this report and think this is a trip you would like to make why not email me at teresadidi@slowtrekking.com or have a look at the website at www.slowtrekking.com. Looking forward to hearing from you.